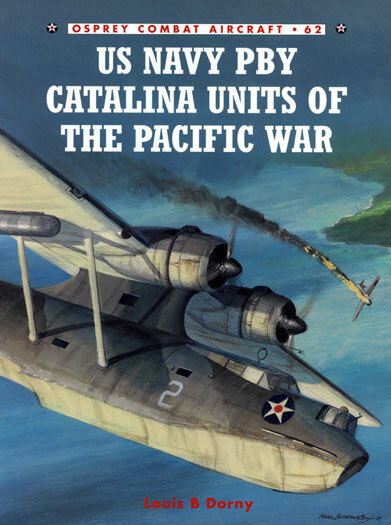 New from Osprey Publishing and number 62 in their Combat Aircraft Series is US Navy PBY Catalina Units of the Pacific War. The book is authored by Louis B. Dorney who is a retired US Navy Commander and an acknowledged expert on Consolidated’s PBY (Patrol – Bomber - Consolidated) Catalina and its operational use during WWII. As the title suggests, the book chronicles the employment of the US Navy’s units that flew and fought in the Catalina in the long march across the Pacific from Australia to Japan in World War II. This chapter sets the scene and describes the immediate pre-war era and details the various PBY units the colours worn by the PBY and its employment during the run up to the disastrous Pearl Harbour raid by the Japanese in December of 1941. 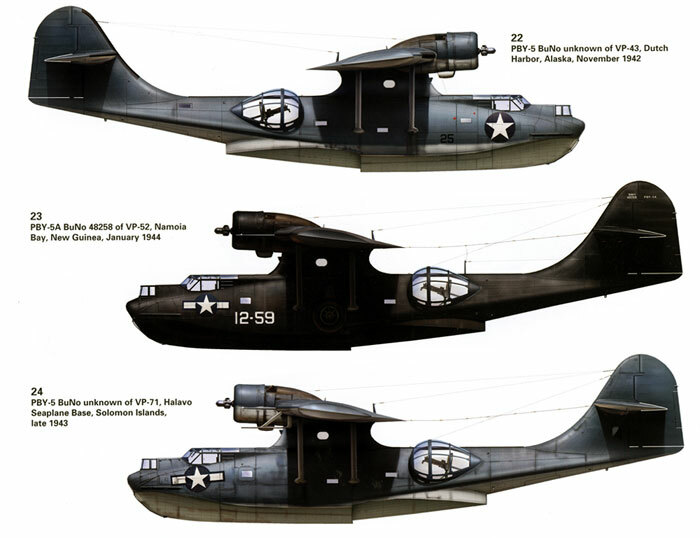 The role played by the PBY in the opening shots of the day in the early morning when a VP-141 machine spotted what turned out to be a Japanese midget submarine. The attack itself and the losses suffered by PBY units and the post-raid rebuilding of the PBY force. This chapter covers the gruelling actions and fighting withdrawal conducted by Patrol Wing 10’s squadrons from the Philippines to Perth, Western Australia. A vast area of the globe indeed and the many actions are covered in this chapter including the PBY’s part in the pivotal battles of Midway and the Coral Sea. Guadalcanal, the Battle of the Eastern Solomons, Rabaul, Bougainville, the battle of Santa Cruz, and the employment of the PBY as a torpedo bomber, more fighting in the Aleutians and the re-organisation and expansion of the PBY force feature in this chapter. This chapter chronicles the PBY’s role in New Guinea, the central pacific campaign and the North Pacific. 1944 found PBY units flying right across the Pacific theatre from the Aleutians in the Northern Hemisphere to Exmouth, Australia in the Southern Hemisphere and everywhere in between. This chapter deals with the central pacific campaign, fighting in the South Pacific and the re-taking of the Philippines. This chapter details the ‘Black Cat’ concept where the PBY was flown at low level at night following the fitting of radio altimeters and British ASV radar which saw the PBY range far and wide across the whole expanse of the Pacific theatre. Many a downed flyer owes his life to the PBY and this chapter informs on the US Navy’s account of the DUMBO concept from its early missions of December 1941 in the Celebes Sea to the seas off New Guinea, Bougainville and Rabaul. The end of a long war and the inevitable reductions in units and production of the Catalina are discussed in this chapter. The books’ single appendix provides a description of the 32 colour plates that features the artwork of Jim Laurier. The profiles illustrate well the four basic schemes worn by US Navy PBYs, the early “yellow wing” schemes, the blue grey over light grey scheme, the tri-colour scheme and the overall matt black scheme. Further artwork appears on the front cover, this time by Mark Postlethwaite and his painting depicts the shoot down of a Tianan Koutai ‘Zero –Sen’ by a Patwing 10 PBY on 10 December 1941. The book itself comprises 96 pages printed on glossy paper between thin cardboard covers. My dad grew up in Perth, Western Australia during WWII and lived in Shenton Park just a short hop from where Pat Wing 10 operated their PBYs from Crawley Bay. His reminiscences of the PBY operations left me with a desire to find out more about both the PBY and Pat Wing 10. Through the years I have managed to visit the remains of two of Pat Wing 10’s machines here in Western Australia as well as amassing a collection of books. This book too will go into that stash as it provides an easy to read and comprehensive “big picture” view of the PBY’s role in the Pacific War. Thanks to Osprey Publishing for the sample.